The day of love and celebration has been a day that I’ve ducked and weaved for a long time, in fact for the last 19 years because that is how long I have been motherless. Flicking channels to avoid the advertising onslaught and skipping church to avoid the happy families still together. I was a teenager when she left, taken by cancer at 36, an age that seems preposterously young now that I’m a similar age. The importance of her and the hole she left in the middle of me is a scar too vast to describe. Yet with time, memories fade. I have shady recollections of ages and events. Birthday parties, jumping on my parents 70’s water bed, first days of school, car trips, hot summers; some are vivid but most are grainy and discoloured like old photos in a sticky paged album. No matter how hard I screw up my eyes, I can no longer remember her smell or the sound of her voice or what it felt like to be held by her. When I was raw with fresh grief, this was my greatest fear, the forgetting. And still, all these years later, I would pay the pain over again for a bundle of crisp memories. For an adult conversation with my mother. For just one glimpse of her delight watching my own children. With the forgetting comes the imagining. Imagining what sort of woman she was. What sort of Grandmother she would have been and the conversations we would have. These imaginings are just fantasies but there ARE realities. Though I can’t describe her face, the centre of me knows her. In ways I can’t describe, I know that my beliefs began with her. My internal voice says things that she would have said. I love my children like I was loved. The mother I try to be is based on knowing her, and on losing her. The mother we are to our children in childhood shapes them; this is a big realisation and a big responsibility. Hold them close, love them hard and keep doing your best. Motherless daughters are too many. If you’ve been shaped by losing your Mum, I want to say: I know. My heart is with you. I’m so sorry for your loss then. I’m so sorry for your loss today. I’m so sorry for your loss every day, as you miss her in different ways. If it helps, even a little, I’d love you to share something about your Mum here. Another night, another night of broken sleep. When our third child was born, I said to my husband, ‘Let’s not count hours of sleep any more’. After all the only thing worse than getting through the day feeling like you’ve had three hours sleep, is doing the maths and KNOWING FOR CERTAIN that you only got three hours sleep. After the last few weeks my sleep bank is empty. In fact it has a second and possibly a third mortgage and the bank is about to repossess my sanity. Sick kids? Teething baby? Yes and yes but last night, it was the Care Bears who made the latest sleep withdrawal. My 4 year old is a sensitive soul. Easily disturbed. Easily devastated. Our last trip to the museum has been bitterly regretted, since the nightmares about the low lights and dinosaur bones started. She is puzzled why chicken, the bird, and chicken, the food, is called the same word; we can’t bear to break the news. Still wells up when she talks about her old scooter that I put out for the verge collection last year, because it was part of her family and she LOVES her! Can’t bear to watch any kids’ movies; the dog catcher in Lady and the Tramp, the fish attack in Finding Nemo, the witch in Tangled… The girl is even nervous about Sesame Street; hates the way Grouches pops up from his trash can so suddenly and don’t even get me started on the Count! But care bears. Lovable, friendly, cuddly care bears in pastel shades with rainbow pictures. Surely that is a safe bet. Surely that would be a perfect choice for a lazy afternoon. Rookie mistake. Should have read the fine print about the Care Bears saving The Kingdom of Caring from EVIL! Yes Evil! Turns out no preschooler movie is complete without a dash of evil. Turns out our G rated Care Bears DVD was quite dark in places and those places came back to haunt us at 1 am, 3am, 5:30am… you get the picture. In my opinion monsters and dark lords and cackling laughter have no place in kids media. More farm animals and car races and play school crafts I say! If I tell you how very careful I am about what goes into my small girl’s head you may laugh or call me overprotective or a ‘helicopter parent’. Yes I do rewrite the bits in Beatrix Potter about foxes who hunt puddleducks and farmers who love rabbit stew. Yes I do hide the kids’ movies away after a nightmare or three. I’ve never discussed death or poverty or war or any number of topics that are real but do not yet need to be real to her. There is only a tiny window of innocence at the start of each small life and while I will never be dishonest with my kids when they ask the tough questions, for now innocence is bliss (and we all get more sleep this way). Is this censorship? Is this wrapping in cotton wool? Should I be taking the boogie men away or encouraging her to face her fears and harden up? What is the right way to parent a sensitive kid? I just read an inspirational post about a typical day at home with toddlers today. It involved a snugly readathon, Montessori play, a spot of nutritious baking and a gentle nature walk. It put me in a… sh…let’s say, sharing mood. Wake up. Feed baby. Cuddles in bed. Referee tantrum about who gets up first. Comfort devastated 3yo when Daddy goes to work. Change nappies x 3. Dress wriggly bodies x 3. Clean up first toilet training accident of the day. Redress 3 yo. Referee fight over who gets which coloured bowl. Make 3 x breakfasts. Make breakfast number 4 for one that’s changed their mind. Grab handful of BBQ shapes for my breakfast. Clean untouched weetbix off floor and baby. Redress baby. Referee fight over toys. Pack dishwasher. Hang out washing. Beauty routine (ha!) i.e. : spray on dry shampoo and wash face. Rescue baby off steps. Resecure broken baby gate. Redress 4 yo who has spilt yogurt down her front. Mop up yogurt from kitchen floor. Get dressed. Find everyone’s shoes. Pack nappy bag. Cut up fruit to take for nutritious snack. Pack swimming bag. Take 3 yo to potty. Reward result with m&ms. Empty potty. Clean up regurgitated m&ms that baby has gorged on while I was emptying potty. Repack nappy bag that baby has unpacked while I was cleaning up regurgitated m&ms. Redress baby. Change baby’s nappy. Get everyone out the door. Bloody cat escapes. Round up bloody cat. Drive to shopping centre. Referee fight over kids’ music vs. talking book in car. Make straight for Target with mission to buy 2 birthday presents, one pair of shoes and one pair of pyjamas. Emerge with one present only. Dash to public toilet and make it in time for once. Go thru drive thru bottle shop (not for Mummy) to buy beer for tradies thankyou present. Drop off tradie’s beer. Drive to pool. Drive in circles for 10 mins to find car spot. Walk 100 m with giant bags x 2 and hungry children x 3. Realise I left nutritious snack at home. Try to detach 3yo from pool step pole for 10 mins. Endure screaming match (aka $20 swimming lesson) for 20 mins. Dry off. Dress jubilant 3 yo. Feed baby. Break up fights between own children and others over ancient toys in the corner. Back in pool for 30 min baby swim lesson. Go thru unnamed drive thru to buy kids meals. Home for ‘picnic’ on floor. Put baby to sleep. Quiet time for 3 yo and 4 yo (ha!) involving very noisy play/fighting/play. Unload dishwasher. Put dinner on in slow cooker. Hang out more washing. Vacuuming. Check emails. Eat leftovers and chocolate while I fill out insurance form online. Call friend. Play game with kids. Change baby. Supervise baby feeding herself. Make afternoon tea. Clean up baby feeding herself battleground. Find everyone’s shoes. Pack nappy bag. Take 3 yo to potty. Reward result with m& ms. Empty potty. Clean up regurgitated m&ms that baby has gorged on while I was emptying potty. Redress baby. Change baby’s nappy again. Get everyone out the door. Drive to library. Spend relaxing educational time doing puzzles, learning to USE OUR QUIET VOICES and borrowing bags of books. Referee tantrum because the librarian gave us the WRONG stamp. Realise I’ve forgotten nutritious snack AGAIN! Buy subway cookies for hungry children. Regret triple choc cookie choice almost immediately. Change 1 year old clothes. Toilet training dash to public toilets ending in poo on feet (won’t say whose). Visit educational play shop to get that second present. Pull children repeatedly off ‘for display purposes only’ play equipment. Quick park play on the way home to assuage guilt for dragging kids to the shops again. Referee tantrum about leaving park. Get washing in. Hang more washing out. Put on rice. Pull weeds. Return work phone calls with phone under chin. Kiss husband. Discover burnt rice. Cook more rice. Serve up dinner. Try and get SOMEONE, ANYONE to eat a few mouthfuls of dinner. Bath. Pyjamas. Teeth brushing x 3. Readathon. Feed baby. Clean up dinner battlefield. Load dishwasher. Put kids back in bed. Clean up toys. Put kids back in bed again. Vacuum again. Shower. Get a few hours of work done. Crash comatose into bed before the night duties begin. This is the abridged version because frankly I was boring myself, the point is, I love days off! A while ago I confessed my eBay addiction. A while ago I promised to share some of my favourite buys for playing. The growing towers of toy boxes in my living room stand as towering monuments to my love of buying second hand toys. I won’t bore you with every thrilling purchase and though I hesitate to encourage you (for fear you will bid against me), if you are buying new and paying full price, then you are paying too much for toys. There are fabulous buys out there and especially as most toys are durable and cleanable, most I’ve purchased are in fabulous condition. But don’t be limited by toys. Some of our most used playthings are not strictly toys. Possibly my favourite and most versatile bargain ever was a stack of old darkroom trays. 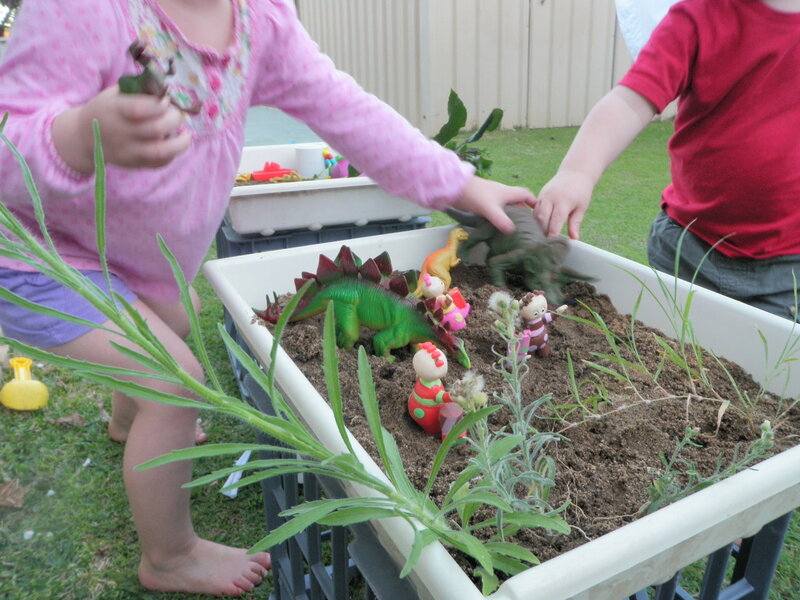 We use these trays for play scenes (add dirt, water, sand and any prompt they can think of – this day it was dinosaur land), sensory play (fill them with raw rice, pasta, goo etc) and water play. The kids sit in them, fill them up, empty them again and start over. Best $5 I’ve ever spent. 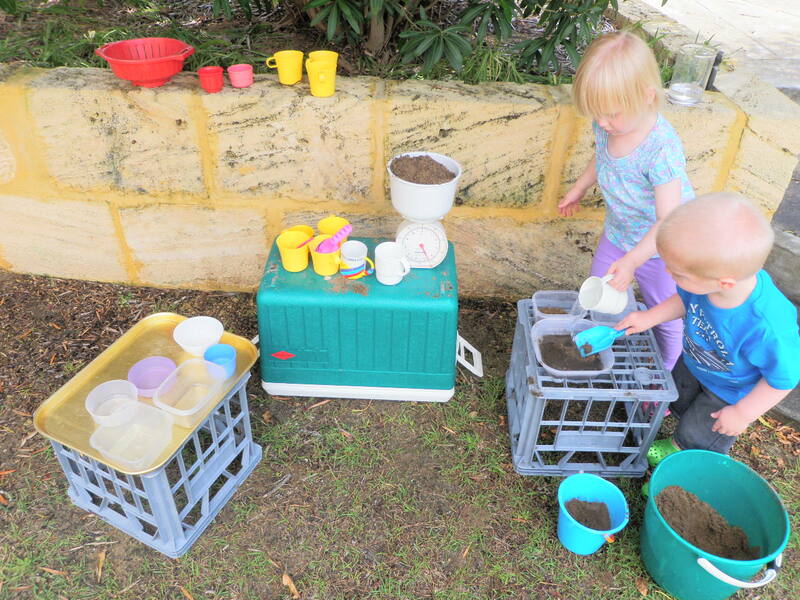 Our entire mudpie kitchen cost less than $5. Bric-a-brac is cheap, garage sales and charity shops are treasure troves of discarded kitchen utensils and containers. I think we may have splurged and paid $2 for the scales which are the favourite of the lot. I don’t have to tell you the beauty of a box. 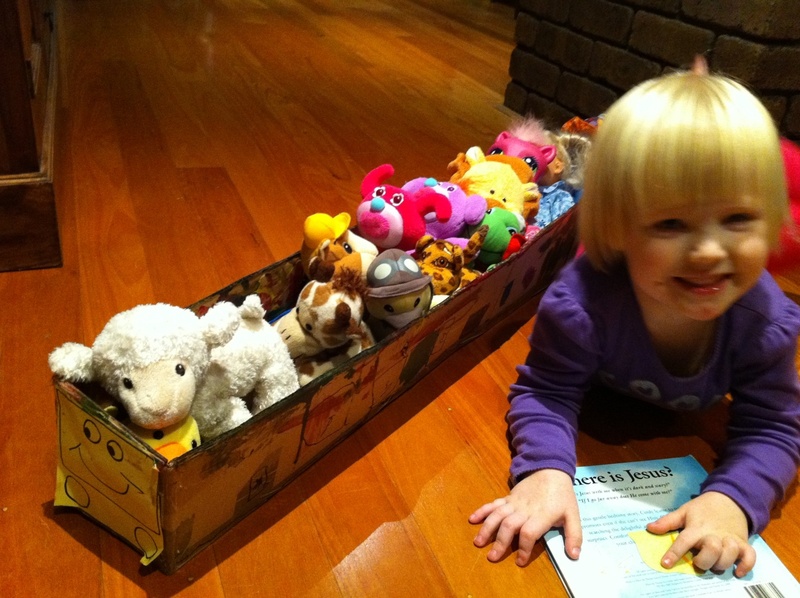 We get maximum value out of a good box by decorating and using in lots of different ways, often as a car, boat or train and always with some soft toys in tow. Note: Soft toys breed on their own so there’s never a need to buy them second hand. Actually maybe I need to write a post about disposing of said soft toys. 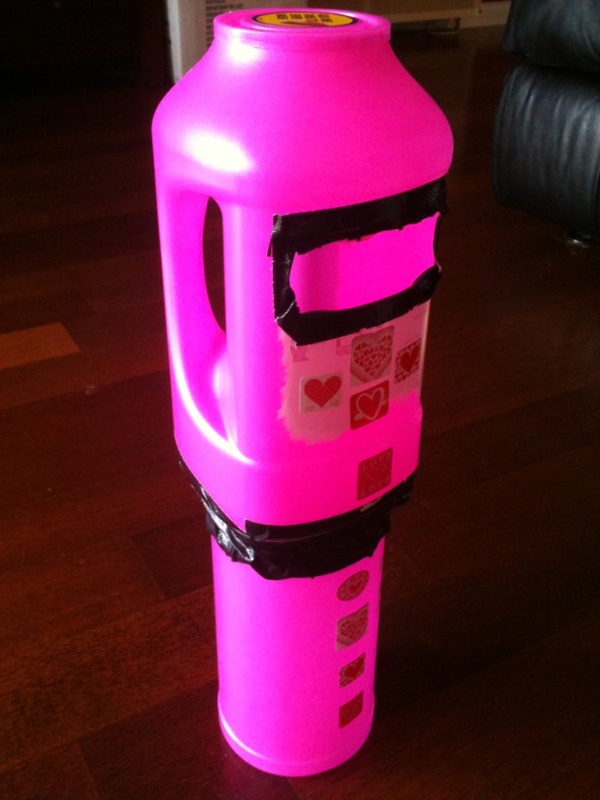 It’s not a napisan bottle – it’s a post box! 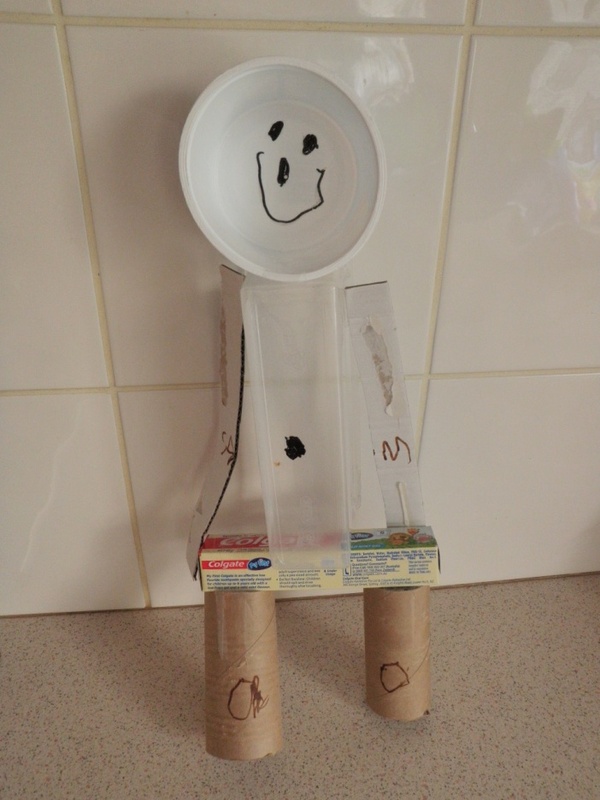 And look how happy this guy is to be saved from the bin! So think outside the box and save the environment, save money and save your sanity by keeping your little people busy with used toys AND non-toys. Waking every half an hour during the night, then every hour, for some unknowable reason. After all that, and Emma to deal with as well, my brain had pretty much turned to three day old mashed potato. I was at complete breaking point. I had my wonderful friends, Tracy and Bernie, offering and giving me a great deal of support and advice, but I needed the problem itself fixed which was something they, nor I, was able to do. So I called Ngala. Blessed be those angels. I had previously been in with Grace for her day sleeps, and it resolved that issue nicely. I had not even though that as she is such a tactile child, all she needed was something to snuggle. So simple, and yet not on my radar as Emma never had an attachment to anything at that age and slept brilliantly. Then the night sleep debacle came along and I immediately thought of Ngala. I was able to get into their night stay program thanks to someone else cancelling. I was actually a little anxious, mainly because I’d tried everything I could think of and it hadn’t worked. The first night stay, I had respite (meaning I was able to sleep and let someone else worry about her – bliss!). In the morning, I was informed she’d slept through the night! That was the first time ever. I couldn’t believe it – she was going to make a liar out of me! Her day sleeps didn’t go so well, but I became more attuned to her tired signs and, once acted upon, was able to get her settled in easily for her night sleep. Well, she slept through the night again! There was a moment at 3.30am where she was making noise and I got out of bed to listen by the door. I had to restrain myself from going in because she didn’t actually need anything. Ten minutes later, she was asleep again. As it turned out, I was the one who needed the training. I knew that her noises where just her way of resettling (she’s very vocal you see. I’m expecting she’ll either be an actor or a lawyer in the future), but I was concerned that she would wake up my husband (who had to work, so it wasn’t fair on him to be woken up) or Emma. In the end, I realised that I needed to be more concerned about myself and Grace than everyone else. After all, Emma could have a day sleep and my husband, well, he could just go and invest in ear plugs. To this day, she sleeps through the night. She’s teething at the moment, so she’s not eating much and might wake at 4.00am or 5.00am. But I change her nappy, give her a feed and away she goes until 7.30am. I couldn’t be happier and I can’t thank the nurses at Ngala enough for all of the help they have given me with Grace. I owe them my sanity. So, if you’re having any sort of trouble with your little ones, please PLEASE call Ngala. They can help you with the problem, and make you feel like you’re not alone. In fact, even your fellow mothers at Playgroup can offer a great deal of support if you’re willing to open up and share. I can certainly vouch for the success of both Ngala and my fellow Playgroup mums – I am a much more confident parent of my little one, I have wonderful friends who I know I can turn to and my baby does not sleep like a baby anymore! We did a craft activity at Playgroup. We were making a sun catcher and there was paint involved and an outline that the kids were supposed to goop the paint on with a pop stick. The kids were doing a super duper job of dribbling the paint on themselves, the floor and splattering the other children; the idea of getting paint anywhere near the outlines was, let’s say, hit and miss. The craft activity itself was fun but not all that interesting (yes, kiddie crafts can be tedious), but what was interesting was observing the parents around the table as we all valiantly tried to get through the activity. One Mama laughed and chatted while her boy finger painted the playgroup walls. Some smiled tolerantly while their little artists heaped the paint on haphazardly, this recovering control-freak had to sit on her hands and grit her teeth to stop herself taking over. One said calmly and then less calmly and then quite irately ‘paint is not food, paint IS NOT FOOD’ over and over and over again while being thoroughly ignored (OK, that was also me). Another had given up the pretence of ‘helping’ and taken control of the pop stick. It was clear that if that sun catcher was going to make it to her window, then it HAD to be perfect and no 3 year old was going to ruin that! Thought: Play (and craft comes under that big banner) is about the process not the product. 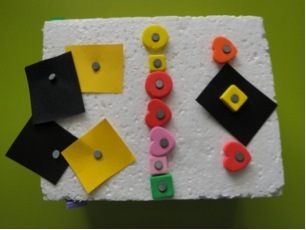 If a kids’ craft project is a thing of symmetrical and perfect beauty, I dare say that something has gone wrong with the process (not to say that kids art is not beautiful, I have drawers full of masterpieces that I can’t bear to throw away). In fact ugly craft is the goal! Ugly means that they’ve done it themselves. Ugly means we haven’t interrupted their creativity with our adult ideas of how things ‘should’ be done. Ugly probably means there’s been some mess made and some goopy fun had. 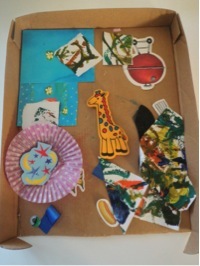 Collecting, cutting and sticking random objects on a squashed reflex box lid (doubt any gallery will be adding it to their collection but the 2 year old had a brilliant time). 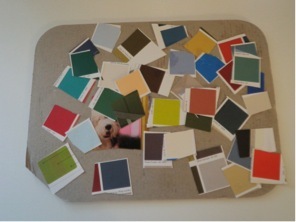 The cardboard from Mummy’s diet coke box becomes a ‘rainbow’ of paint colour chips. (So aesthetically DISpleasing but fantastic cutting practice for the 4 year old). This lump of foam that came around our air conditioner, got this (ahem) lovely treatment. 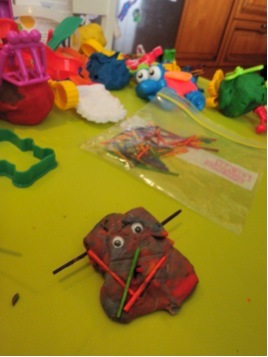 And finally, this one is tough and still makes me look away; let them mix the play dough colours! Embrace the brown (I’m told it makes better monsters). Done is better than perfect. Ugly is better than pretty. If an idea grabs you, run with it, stop being an adult for a sec and let your child do/learn/develop. (At least you won’t want to keep the completed product – storage issues solved!). (Thank me later; FYI my currency is lindt chocolate). The Little Emperor was an early talker, only I didn’t know it at the time. I thought it was “normal”, average, whatever you want to call it. To my first-time, inexperienced Mum eyes he was no different to his peers from Mother’s Group – the talkers were in the majority and they all started at around the same age. His first words came thick and fast at 14 months – labelling things around him at a rapid rate: Mama, Dada, ball, car, truck, dog, cat … and so on. I couldn’t even tell you which one came first because they came so rapidly. Before his second birthday he was speaking in full sentences: “Turn that one off Uncle Joe. It’s too noisy!” (about a toy he got for his birthday), “Mummy’s driving Uncle Robbie’s car” and Like I said, I thought this was “normal”.Now, I realise that it probably wasn’t. Not to say he is some kind of child prodigy, but in terms of language development he was probably slightly advanced for his age. The Smiling Tiger is my average talker. At 19 months he has a handful of words that he uses infrequently and a wide variety of animal and machinery noises that he use frequently. He can talk, he can say some words clearly, but most of the time he doesn’t say much unless coaxed. Food words are his best; he loves eating and would jump through any hoops to get that snack! I was getting concerned about his lack of words so I went to visit the Child Health nurse recently. I wanted to make sure there wasn’t anything physically delaying his speech and I guess I just wanted peace of mind that my beautiful boy wasn’t falling behind. I would rather know sooner and do something about it than wait until he was really delayed. His hearing and comprehension are fine, I was sure of that, but I just couldn’t understand why the words weren’t coming! The Health Nurse was lovely. In her opinion the Smiling Tiger is very normal, but she gave me an Ages and Stages Questionnaire to fill out and if I had any further concerns I could make another appointment. She was very reassuring and I did leave feeling better. We got home and he pointed to the pantry and said ‘gacka’ (cracker!!). I felt a huge wave of relief. All that talk with the nurse about speech concerns and he decides to ‘throw me a bone’ so to speak; say something to stop me worrying. According to the results my Tiger is doing okay for his age in terms of language – he is not in a ‘to be concerned’ area, but is right on the average. That was great news! Ah, relief! Not so surprising to me, his results for physical attributes like fine and gross motor skills were perfect scores. I’m not surprised as he has always been co-ordinated and physically ‘advanced’ (for want of a better word!). Watch this space; I am sure he will be a well- known sportsman in the future! I know one day, hopefully soon, I will be wishing that he would stop talking, like I do with his chatterbox brother, but at the moment I love to hear the words come out of his mouth one by one. 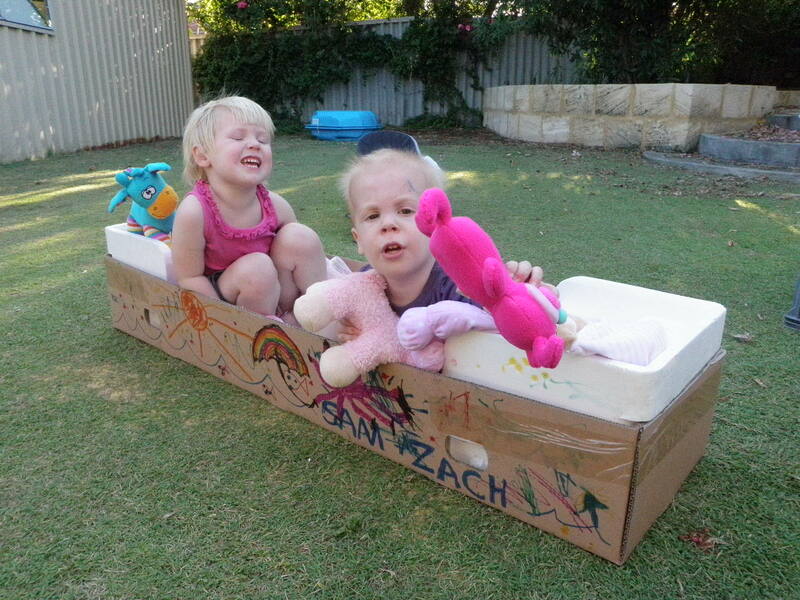 If you want to contribute to our blog, please contact us at marketing@playgroupwa.com.au.